Here’s the first of two FLOODING cartoons I’ll be sending your way. The second one has more detail than I could manage this week, so it’ll go out next Thursday. 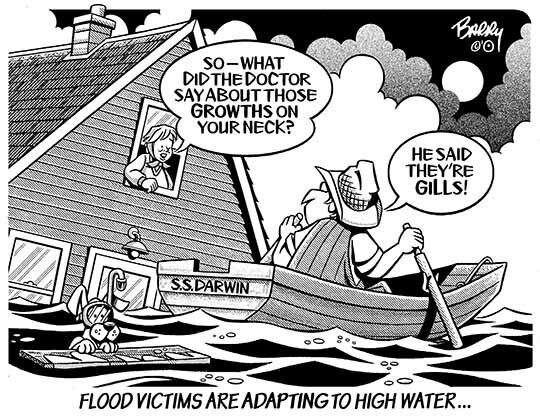 This high-water toon ought to cover those of you whose backyards are already swelling with Winter run-off. Given the enormous volume of white stuff that remains unmelted here (with another 12 inches of snow forecast tonight & tomorrow), I reckon the second toon underway will be just as effective whether I send it a week from now — or in another month or two??? HA! Yep, leave it to your cartoonist to find humor in everything. But then, that is my job, eh? 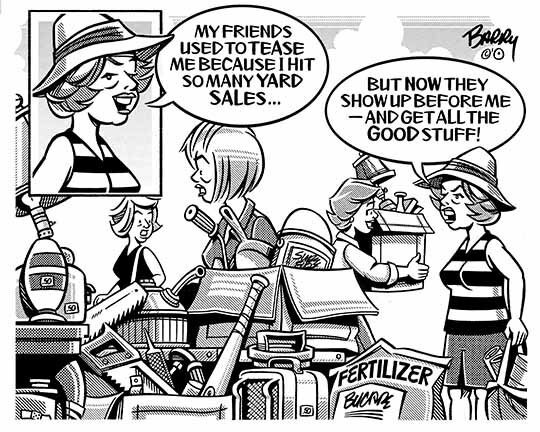 Finally, the YARDSALE cartoon I promised you on Friday. There’s not much that’s socially redeemable in this toon, just my usual picturing of local folks & how they perceive life around them — with small town human nature fully in play! Maybe you’re also into YARDSALING, though somehow I doubt it. I figure you have precious little time for such, except, that is, when you’re out & around town looking for photo opportunities — & pick up a few things along the way. HA!